We love to provide the latest industry news and video streaming insights from around the world, but today we have our own exciting news to share. We’ve just launched Cleeng Capture: a brand new development which is a lot more about learning than it is selling. As video publishers and providers, most of the focus is placed on getting your service out there and ramming it down the public’s throats (so to speak) in order to spread the word and get those all important conversions. But what if you knew more about your target audience so you could be savvier with your sales efforts? Essentially, we are launching a new product called Cleeng Capture that will allow publishers to get into their viewers profile and behaviour. User’s information is considered as a currency nowadays, and it could serve businesses to make smarter decisions and create better offerings. Apply automatically your branding and keep it consistent. By simply turning on Capture within your account (it takes you a second), you can set up your polls or questionnaires that matter to you. You are able to customize the user journey by choosing the information you would like to gain. After the user authentication, and optional input of additional data is complete, you will have access to a detailed dashboard and all the user data you wish to receive, and all the user/viewer has to do is populate their data once for any one publisher – which means their experience won’t be compromised in any way. Note: The feature works at publisher level, meaning that the settings work for all the publisher offers. 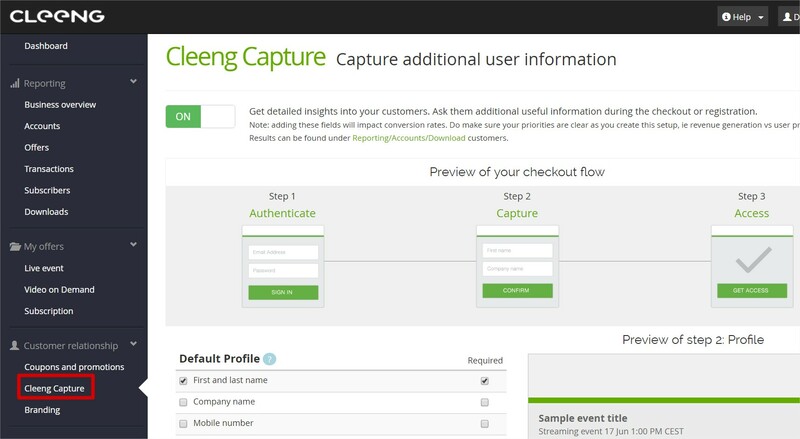 Cleeng Capture is a tool that helps publishers understand their viewers and target audience. The focus is on learning, rather than selling. SVOD broadcasters that want to collect additional information about their subscribers (paid offers). The great thing for publishers is that the Cleeng Capture will be free of charge, aligned on the event readiness set-up at publisher level. Lots of our publisher clients were asking for a service like Cleeng Capture for a longer period. And, we exist for our publishers, so rolled up our sleeves and came up with a simple solution that works. Even in its early stages, Cleeng has proved effective among a host of companies, including IMG Academy, Event Ride Masters (live events) and Fanseat, NHRA (season pass/subscriptions). In the fast-paced digital world of online video, intelligence pays and the early bird catches the worm. If you’re a publisher and you would like to take your services to the next level, please do get in touch and we will be happy to tell you more about our Capture service.